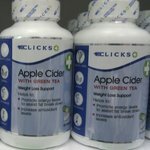 May 30, 2011, 10 p.m.
Clicks is marketing an apple cider/green tea supplement to support weight loss. But the only thing that is slim is the evidence for the efficacy of this product. Surely we should expect better from a large company with a reputation to protect?